Railtel Vacancy 2017 Upcoming Jobs Opening For MBA, B.Tech in Railtel Corporation of India, 31st August Railtel Latest Vacancy 2017. DCPW Recruitment 2017 Vacancy in Directorate of Coordination Police Wireless MHA 27 Jobs for Freshers DCPW MHA Despatch Rider Recruitment. NIELIT Recruitment 2017 Upcoming Vacancy in 524 Scientist B, Executive, CFO, Last Date 3 September, NIELIT Latest Recruitment 2017. MSME Agra Vacancy 2017 in PPDC Jobs Opening For AO, Technical Assistant, Technology Development Centre MSME PPDC Agra Vacancy 2017. DIPR Recruitment 2017 Jobs in Defence Institute of Psychological Research 13 JRF DRDO, 31st August DIPR Psychology Recruitment 2017. AFCAT Vacancy 2017 is a Special Entry & Meteorology Branch For Air Force Commissioned Officer, Last Date 31st August 2017. Eastern Naval Command Recruitment 2017 Jobs in Indian Navy For MTS, Medical Officer in Eastern Navy Command Upcoming Recruitment 2017. National Savings Institute Recruitment 2018 Latest Short Term Job in NSI India, Apply Online National Savings Institute Delhi. Lok Sabha Secretariat Vacancy 2017 in Parliament Of India Translator 31, Last Date 14 August Lok Sabha Latest Vacancy 2017. National Institute of Pathology Vacancy 2017 Latest Jobs For Clerk with Graduate Pass to Apply For National Institute of Pathology Delhi. 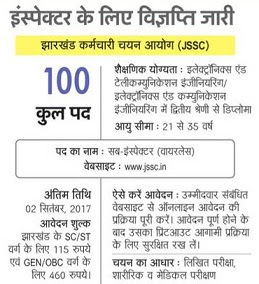 JSSC SI Recruitment 2017 in Jharkhand 3022 Sub Inspector Bharti Latest News to apply JSSC Police SI Recruitment 2017.